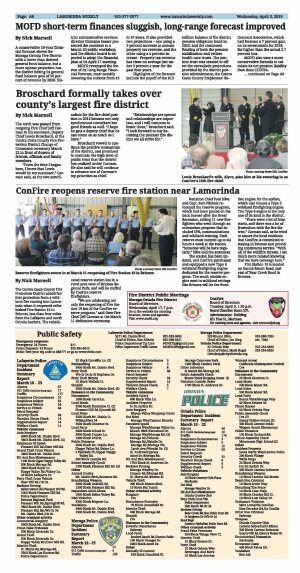 The Contra Costa County Fire Protection District added further protection from a wildland fire roaring into Lamorinda when it reopened refurbished Fire Station 19 in Briones, less than four miles from the Lafayette and north Orinda borders. The rededicated reserve station lies in a rural area west of Briones Regional Park, and will be staffed by ConFire reserve firefighters. "We are celebrating not only the reopening of Fire Station 19 but of the ConFire reserve program," said then-Fire Chief Jeff Carman at the March 11 dedication ceremony. Battalion Chief Paul Silva and Capt. Sam Nichols revamped the reserve program, which had been placed on the back burner after the Great Recession, adding 11 new firefighters who went through an orientation program that included CPR, communications and wildland training. Each reserve must commit up to six hours a week at the station. "Someone will be here regularly," Silva told the attendees. The station has been updated, and ConFire purchased and equipped a new Type 6 wildland firefighting engine dedicated for the reserve program. The small, nimble engine used in wildland settings like Briones will be the front-line engine for the station, which also houses a Type 3 wildland firefighting engine. The Type 6 engine is the only one of its kind in the district. "There were a lot of false starts, and there was a lot of frustration with the fire district," Carman said, as he tried to assure the local residents that ConFire is committed to staying in Briones and providing continuous service. "With all of the wildfire threats, I am much more relaxed knowing that we have coverage here." Fire Station 19 is located on Garcia Ranch Road, just east of Bear Creek Road in Briones.